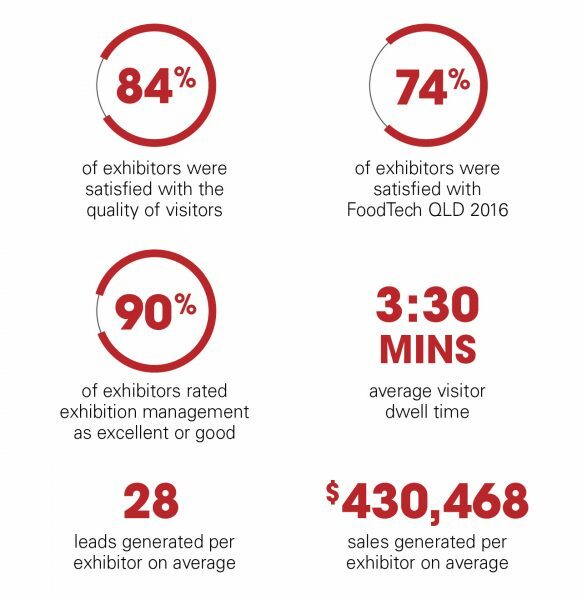 FoodTech Qld attracts food manufacturing professionals with real buying power, coming to see trusted suppliers, new equipment to create efficiencies and remain at the forefront. Queensland’s food sector contributes more than $16.9 billion to the state economy and is the second most important export commodity earner. With close proximity to the Asia-Pacific markets and quality local produce, many Australian and international food companies have processing facilities established in Queensland. FoodTech Qld is the opportunity to place your brand in front of the state’s burgeoning food and beverage manufacturing industry. Statistics collected from the 2016 Post Show Survey. “We were extremely happy with our decision to exhibit at FoodTech Qld. Connect with qualified Queensland industry buyers and decision-makers. Generate immediate and long-term sales leads. Build brand awareness and put your company ahead of your competitors. Place your products in the hands of potential buyers. Build a prospect database and confidently follow up.